Lorraine Hansberry is the playwright best known for writing A Raisin in the Sun, which made her the first female African-American writer to open a show on Broadway. By the time The Sign in Sidney Brustein’s Window opened in 1964, Hansberry was in the final months of a losing battle with cancer. An act of love to the very end, Sidney Brustein was polarizing, to say the least. Critically savaged by some, though earning fierce devotion from others, it was attacked by critics for packing in too many different contemporary social issues. Watching the play today, it's obvious that it's the work of an artist desperate to say as much as possible in the short time she had left. 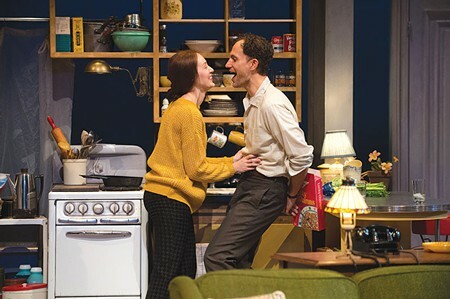 The Sign in Sidney Brustein's Window opened at the Oregon Shakespeare Festival on February 15 and will continue playing through July 3, 2014. OSF is a not-for-profit professional theatre founded in 1935; their season runs Tuesday–Sunday February through October in three theatres: two indoor stages and a flagship outdoor Allen Elizabethan Theatre. When you visit you can see one or two plays or up to nine plays in one week. For information about OSF, visit www.osfashland.org. Sofia Jean Gomez and Ron Menzel play radical artists in Hansberry’s The Sign in Sidney Brustein’s Window. Photo by Jenny Graham.